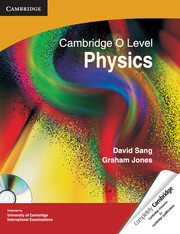 Cambridge O Level Physics matches the requirements of the Cambridge O Level Physics syllabus. Cambridge O Level Physics matches the requirements of the Cambridge O Level Physics syllabus. All concepts covered in the syllabus are clearly explained in the text, with illustrations and photographs to show how physics helps us to understand the world around us. The accompanying CD-ROM contains a complete answer key, teacher’s notes and activity sheets linked to each chapter.